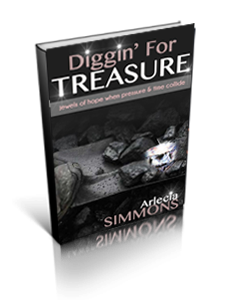 In “Diggin’ For Treasure,” you will find what I call “jewels,” which are devotional entries that will prayerfully encourage your hearts, challenge stagnant spirits, ignite laughter, and help you begin the excavation process to discover your own treasure. I have dug through emails, journals, blog posts, and my memory to share with you 40 jewels for your journey. Enjoy and as always, look and live!